Holiday home in favourable location with enclosed garden and a path (150 m) takes you to the sea in no time (no beach but level stone plateaus for lovely sunbathing for nudists) The beautiful, large white sandy beaches are only a 10 minute drive away. 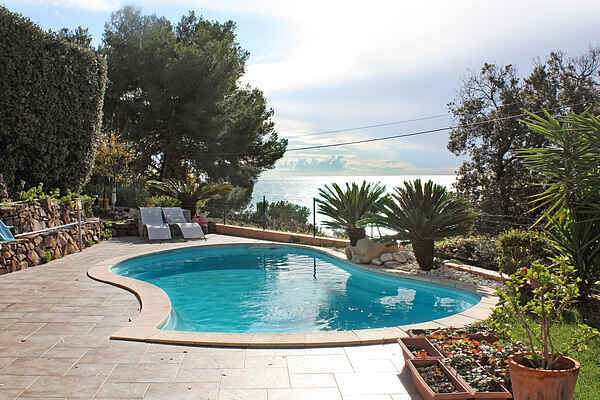 The well-kept holiday home is situated on the coast near the pleasant beach resort Carqueiranne between Toulon and Hyères. The azure blue here forms a stunning contrast with the green of the pine trees. Carqueiranne town centre is home to some lovely restaurants and outdoor cafés. The city of palm trees, Hyères, with its charming shopping streets and beautiful squares is only 7 km. away. The Plage l'Almanarre, especially well-known to (kite) windsurfers, is only a few kilometres away. If the afternoon sun is getting too hot for you, visit the nearby copper mines. A fun underground adventure, for children as well! Also a must is a visit to the island of Porquerolles, just off the coast. You can take the ferry from the peninsula of Giens and then hire a bicycle (bike hire on the island) to explore the island and the most beautiful beaches. Another day you can visit the stylish town of Saint-Tropez (52 km.) and the charming water village of Port-Grimaud (47 km. ).